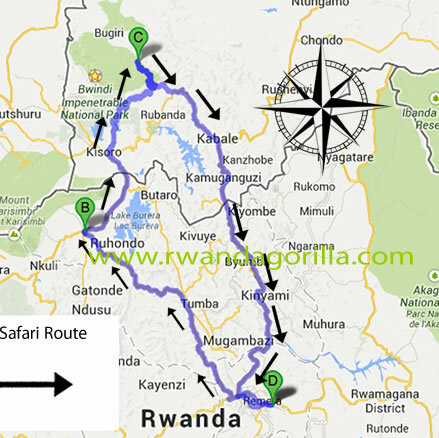 This 5 days gorilla tracking tour starts and ends in Kigali. 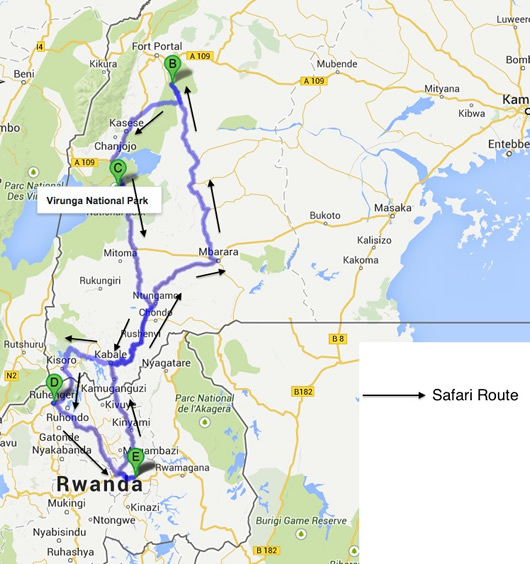 ITINERARY FOR 5 DAY UGANDA AND RWANDA SAFARI. In the morning, you will gather at the park headquarters for briefing. 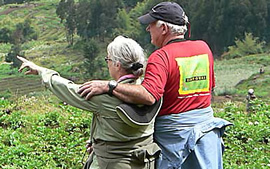 You may either go for golden monkey tracking or hike up to Karisoke research centre, established by Dian Fossey, an American primatologist who dedicated all her life conserving the lives of mountain gorillas until she was killed and is buried there next to Digit, a mountain gorilla. You will learn more about the lives of the mountain gorillas at the research centre. On return, you will cross over to Uganda and drive to Bwindi impenetrable national park, home to half of the world’s remaining mountain gorillas. Dinner and overnight at Bakiga Lodge (mid-range)/Gorilla Safari Lodge/Chameleon Hill Lodge/ Gorilla Mist Camp (luxury) Safari Lodge (Luxury). In the morning, assemble at the park headquarters for briefing from the park rangers about the dos and don’ts while with the gorillas. Proceed for the memorable adventure in the forest, an activity that may take 2-6 hours depending on the movement of the gorillas in the wild. Meet and stay with the habituated mountain gorillas for at least an hour. As you exit the forest, your tour guide will be waiting to transfer you to the lodge for relaxation / lunch. In the evening, you may visit the nearby Batwa community. Dinner and overnight Bakiga Lodge (mid-range)/Gorilla Safari Lodge/Chameleon Hill Lodge/ Gorilla Mist Camp (luxury) Safari Lodge (Luxury). Mountain Gorilla View Lodge is situated about fifteen minutes from the park offices, at the base of Sabyinyo Mountain.